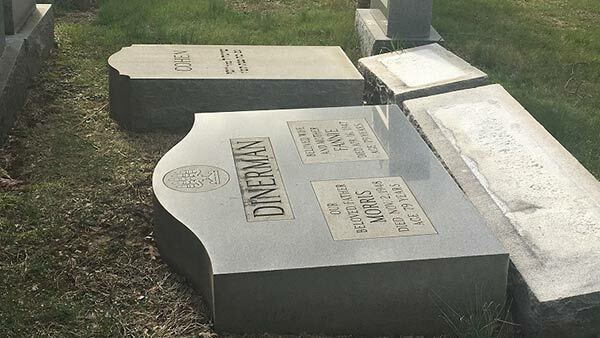 SPRINGFIELD, Pa. (WPVI) -- Police say the damage spotted in a Delaware County Jewish cemetery is not a case of vandalism. The Springfield Township Police Department said on Saturday morning that investigators have been in contact with the owners of the Mount Sharon Cemetery. They say the grave stones found on the ground could have been toppled in a number of different ways. "There are no vandalism incidents that are currently being investigated," a police statement reads. Action News viewer Mona Erza sent in photos that showed the damage earlier Saturday morning. Erza said she and her mother went to visit her father's grave. When they arrived they found several of the stones on the ground.